Exposure to mold in the home can cause serious health problems. One hidden place that mold can grow is within your air conditioner; with air constantly circulating through the unit into your home, mold spores are picked up and pushed into your living areas. Be watchful for signs that mold could be lurking in your AC, including a musty smell when the unit is running or visible mold on the exterior of the unit. If you notice these signs, the following steps will help you safely clean mold from your window air conditioner unit. The following mold removal process should be performed in an area with good ventilation. Put on your safety gear (mask, eyewear, and gloves). 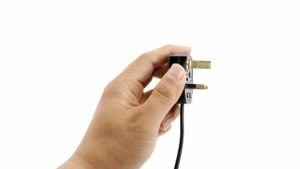 Turn off the air conditioner and unplug the unit from its power source. Take off the front body grille of your unit. On most units, this can be done easily by pulling it forward and pushing down slightly. If the grille is screwed in, use the screwdriver to remove the screws . If your filter is washable, as most window unit’s filters are…place the filter in your sink and sprinkle it with laundry detergent. 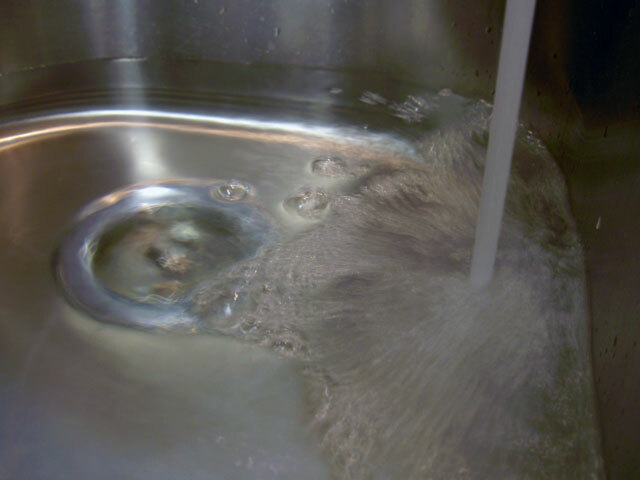 Fill the sink with enough hot water to cover the filter. Let the filter soak for 15 minutes. 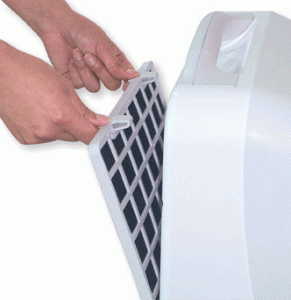 Next, use the scrub brush to clean both sides of the filter. Rinse out the filter with clean water and hang it to dry. Next, go back to your air conditioner unit and unscrew the metal cover located behind the front body grill and lift it directly upwards. Use the vacuum and attachments to clean out as much dirt and debris from the interior of the unit as possible. Wipe out any visible mold growth. In your bucket, mix a solution of ½ cup bleach, 1 tablespoon mild dish soap, and 3 gallons hot water. 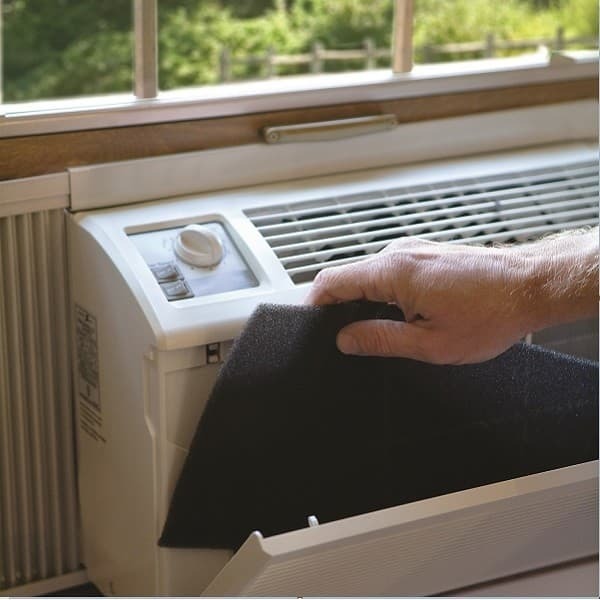 Using a cloth, brush, or sponge, soak up the solution and scrub the moldy areas of your air conditioner well. Also clean the air conditioner front grille if that has mold on it. Allow the solution to sit on these surfaces for approximately 10 minutes, then rinse with water and a damp cloth. Let the unit, filter, grille, and metal cover dry completely. Reassemble the air conditioning unit and plug back into its power source. 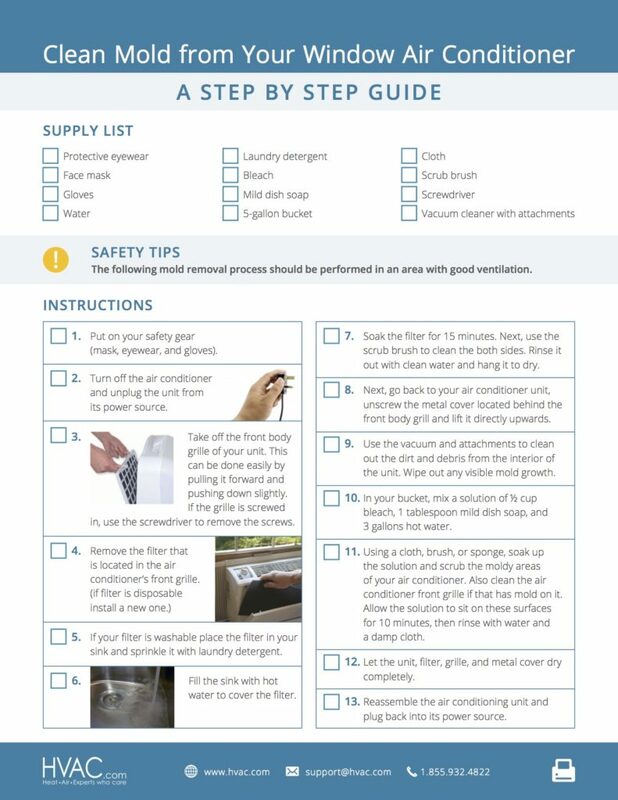 We hope this step by step guide on how to clean mold from your window air conditioner was helpful! For more information about air conditioning systems and maintenance procedures, check out our Complete Guide to Air Conditioning here.